Hit With Three Feet Of Snow Again! 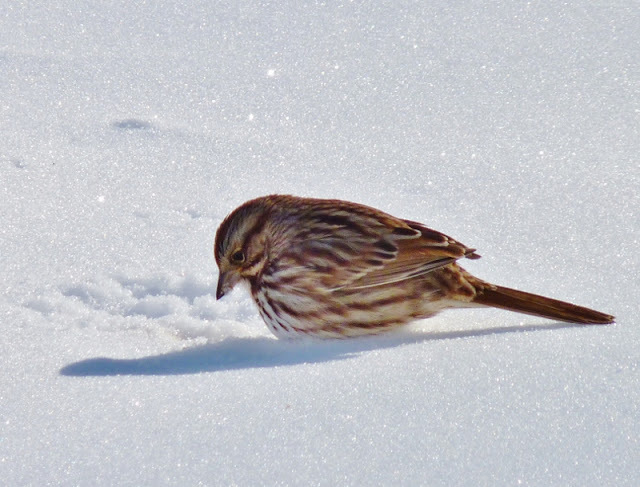 The Snowstorm we had a couple of weekends ago really slowed me down. This is a view looking down my driveway. Our cars were buried under the snow and I couldn't open the doors to my house. 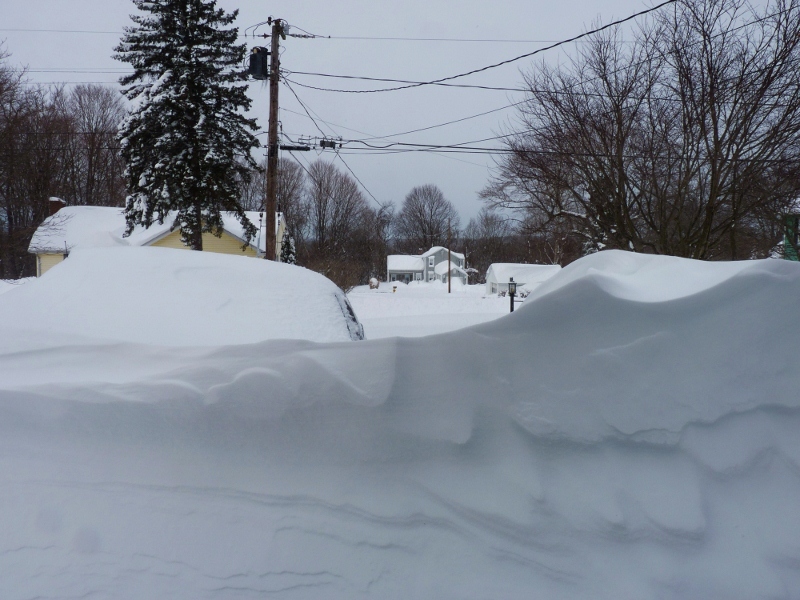 Total snowfall was about 3 feet and snow drifts on my roof were 8 feet high in some spots. I spent the entire weekend shoveling around the house and raking snow off the roof. It seems weather patterns are changing because major storms of all types are becoming more common. I don't know if it has to do with global warming or not but this storm was a reminder that we are all at the mercy of mother nature. I am thankful that we haven't suffered any major devastation due to weather over the years. After the storm this Song Sparrow saw his shadow so I guess that means six more weeks of winter. As for me, I'm ready for Spring now! Cabin Fever Or Cabin Cure? I recently rented a cabin at Mowhawk Trail Forest. It was the oldest and smallest of the six that were available but it was a bargain at $30 a night. 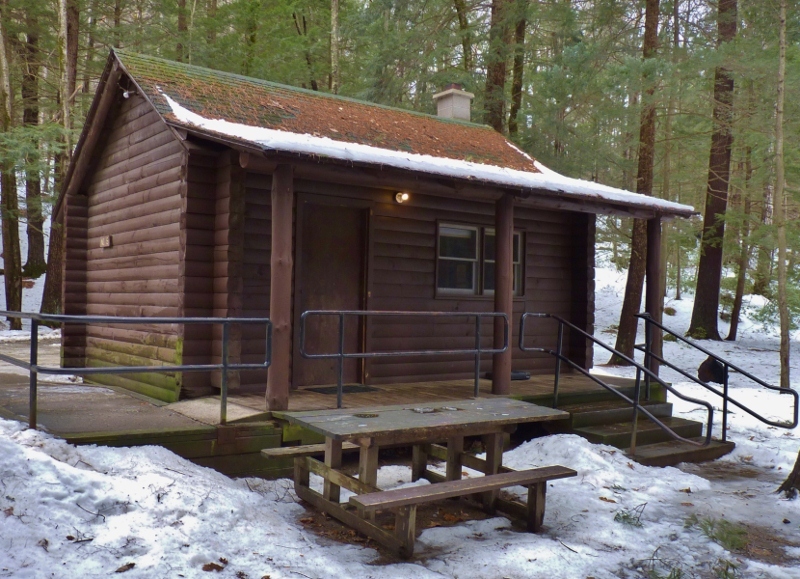 100 years ago someone living in a tiny cabin like this in an isolated area during the middle of winter might have ended up with a real case of cabin fever. People didn't have all of the modern conveniences like we have now to keep them entertained. Staying in a place with nothing more than a wood stove and an electrical outlet is what I'd call a cabin cure. I find that it's healthy to take a break from cell phones, computers, watching people text each other, and around the clock negative news. 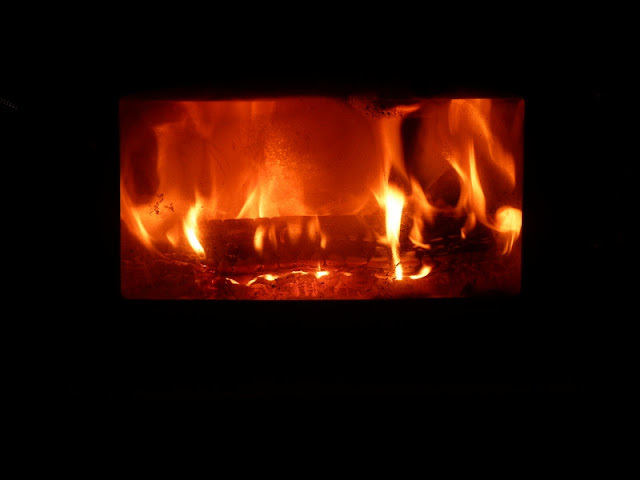 I spent a lot of time just sitting in front of the wood stove reading books-( the kind with paper and a hard cover). I found one book called Upstream: A Voyage On The Connecticut River by Ben Bachman. I live near the Connecticut River and do a lot of my birding on land near the river. The author gave historical information and descriptions of his encounters with nature during his canoe trips from Old Saybrook all the way up to the headwaters in Pittsburg New Hampshire. Reading this book in front of wood stove while heavy winds were howling though tall pines outside the cabin seemed to be a perfect setting. Of course, I didn't stay in the cabin all day. I hiked some of the trails in the area. 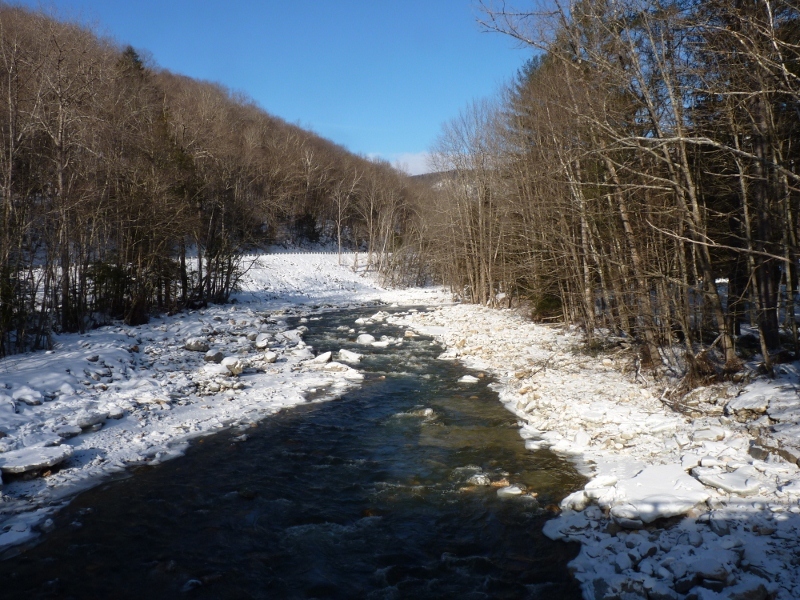 This is the Cold River which runs through the Mowhawk Forest. There are some trees in the forest that are 500 years old and some of the White pines are over 150 feet tall-(See Wikipedia). 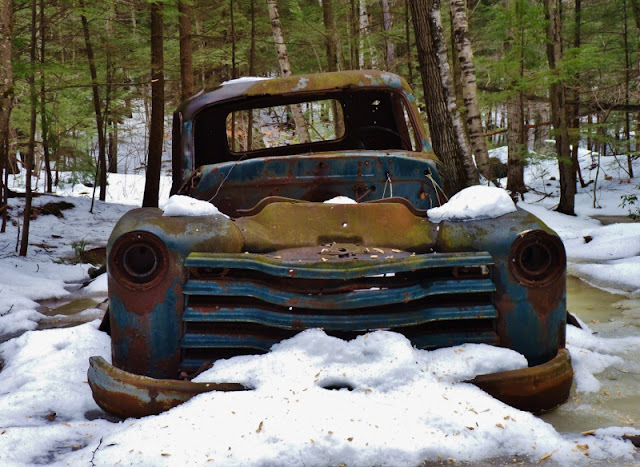 I found an old car along one of the trails. I'm thinking it's too late to call AAA but a little duct tape and some bondo could do wonders. I found this sign in the middle of the woods along another one of the trails. 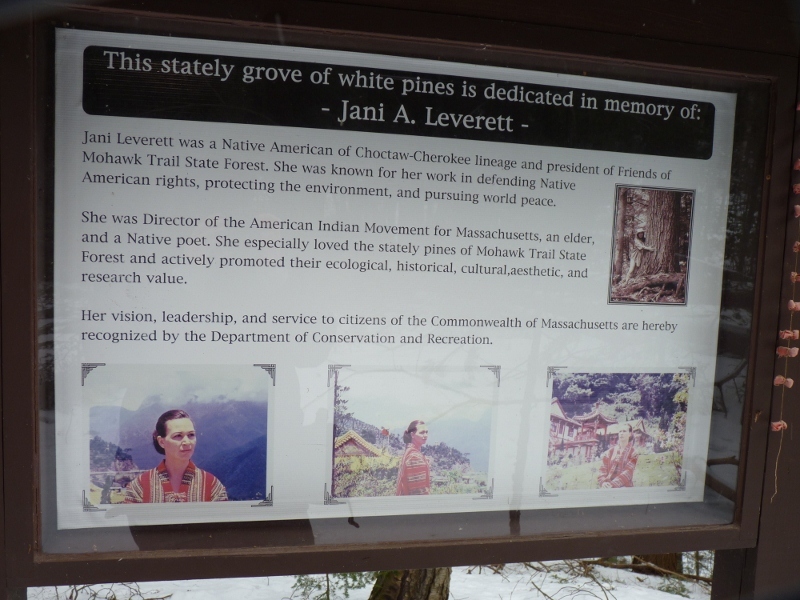 It doesn't tell the whole story about Jani Leverett. I did some google research and found that she had a life that was both colorful and tumultuous at times. I read a tribute to he life from her husband that seems too personal to describe here. I didn't finding many species of birds during my stay. If I had to do a Big January in this area my list would have been very short. 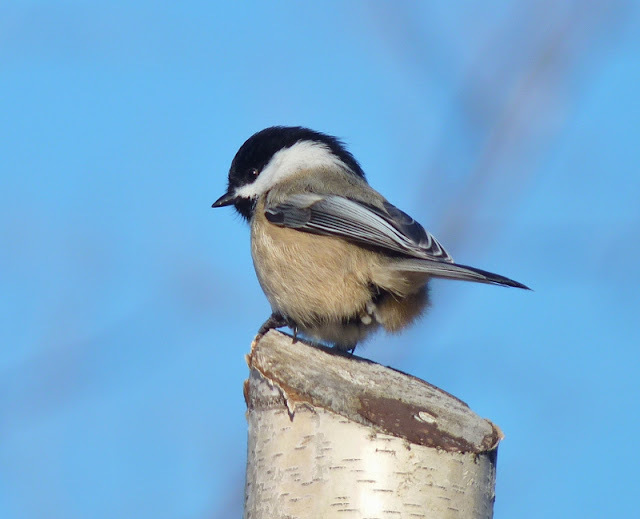 I found some Cedar Waxwings, Common Ravens, Golden-crowned Kinglets, White-breasted Nuthatch, and plenty of Black-capped Chickadees. 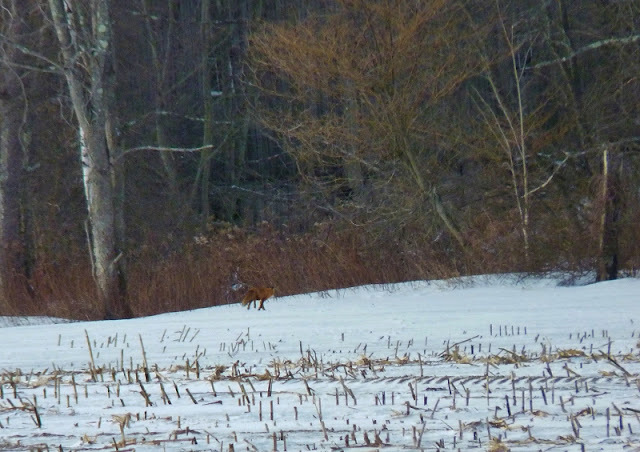 At first it was Mallards and Snow Buntings that brought my attention to this field but then I spied a fox running toward the woods. There is something about staying in a rustic cabin during the middle of winter that appeals to me. I was able to find a real appreciation for things that I might normally take for granted like simple meals, a good book, and a warm fire. Sometimes simple is better.